Toronto, ON – (BasketballBuzz) – Head Coach Roy Rana and his staff have announced the names of the final twelve young Canadians that will be tasked with the responsibility of bringing home a medal at the 2013 FIBA U19 World Championships in Prague, Czech Republic. Led by 2014 Top prospect Trey Lyles and Syracuse Orange Freshmen Tyler Ennis, the 2013 Canadian Junior Men’s National team has the potential to come out of a tough Group A, where it will play Spain, Korea, Croatia and potentially challenge for a medal. The finalized roster is well rounded with talent at the point guard position, multiple options on the wing, that can attack, shoot it, and get at it defensively. The forwards offer up an interchangeable group that features enough finesse, athleticism and raw talent to clean up the boards and compete with world’s more experienced teams. You would be hard pressed to find a better staff to lead this group of players. 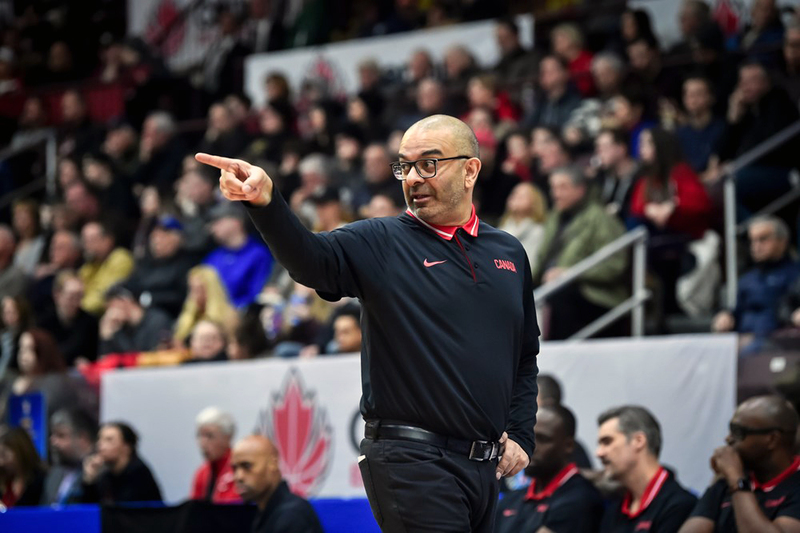 Head Coach <b>Roy Rana</b> is amongst, if not, the hottest coach in Canada right now, and with his Ryerson Rams (CIS) program on the rise and his growing international experience, there’s little doubt that he is the right man for the job. Assisting Rana will be Jamie McNeilly, Student-Athlete Development Specialist at Marquette University and Scott Morrison of the 2013 CIS Men’s Basketball finalist, Lakehead Thunderwolves. Mentoring this extremely talented group of young coaches is Steve Kolchalski, Canada’s Coach “K” and former Head Coach of the Senior Men’s National Team. Below is an individual look at each member of the roster, broken down by their respective positions including some additional insights regarding the exemption of a CIS based players. Pure point guard with natural instincts, Ennis has played at the highest level of American High School basketball and has been throwing lobs to Andrew Wiggins for the past two years on the AAU circuit. Solid rebounder with the necessary vision to find the open man on the break or take it to the tin for tough baskets. Keane will be the first logical choice off the bench to replace Ennis at the point guard spot. Keane comes from basketball family and his natural flair for the game and a pass first mentality is evident. Look for Keane to run the offense when Ennis is out or in foul trouble. Solid PG who will play more minutes this upcoming season with the Redbirds. Proven player at all levels of play. Tremendous energy with the ability to impact the game on the defensive side of the ball. Notice was the MVP of the Red &amp; White game with 16 points and eight rebounds and should challenge for most minutes played each night. Rathan-Mayes is a volume shooter that can change the outcome of a game with his shooting, leave him open and he will knock it down, eventually. Like Tyler Ennis, Rathan-Mayes has gone against the best in the AAU circuit and played alongside Wiggins at Huntington Prep in West Virginia. The best pure shooter on the roster, Clair is the only west coast selection and will be called upon to shoot the ball, where his unlimited range could be a key asset in the international game. Needs to improve physically and show more commitment on the defensive end, but overall, a guy like Clair is a must have for this type of competition. A physical specimen of the Wing, De Ciman should challenge for a starting spot, and should be in the mix and play a significant role for Canada, specially when Coach Rona decides to go to a smaller defensive oriented united unit. De Ciman was amongst the standouts in the Red &amp; White Game12 points and five rebounds. Talented wing player who loves to get to the rim and is not afraid of contact. McIntosh will most likely have to show his improved shooting touch against FIBA rules and could be a solid contributor for the Canadians specially against less athletic teams in the preliminary rounds. Mr. Indiana basketball player of the year in 2012 will anchor the Canadians both inside and out. Lyles is currently one of the most highly recruited players in the Class of 2014, and for good reason. At 6-10 he has the finesse to hit the mid-range jumper and has the athleticism to get to the rack from the elbow as well. He put up 13 points and 9 rebounds in intra-squad scrimmage and was right up there with the best players in the world at the U18 championships where he and Wiggins help Canada qualify for the event. Hardworking forward who quietly goes about his business. Taylor fits in nicely with this group and will be counted upon to be active on both ends of the floor. Okolie played sparingly for Harvard during his freshmen season and will look to take his NCAA March Madness experience and high basketball IQ to Prague in hopes that it will pay dividends for Canada. Great shot blocking ability for his size. Pirovic has the ability to knock down the outside shot which will be key for a Canada as they space the floor and allow Lyles to operate inside. The Maine BlackBears freshmen can also contribute on the glass thanks to his wide frame but will be in a tough battle for minutes at the forward position. The youngest selection, at only 15-years of age Chris Egi won’t just be going to these games to watch. Egi is raw, as expected, but plays with hunger and intensity which will earn him the opportunity to further develop his skills and cash in on a few more NCAA scholarship offers. Canada opens up the championships against Spain on June 27th, Croatia on the 28th &amp; Korea on the 29th. Does this clearly state that Canadian University Basketball (CIS) players aren’t good enough to play at this level? Specially, when you have two of the countries top Canadian University coaches making the calls? With all the NCAA Canadian talent in the pipeline, will we ever see a CIS player on the Canadian Junior National Team? A closer look at 2013 CIS Men’s Basketball Freshmen Awards list reveals only two names which perhaps would at the very least warrant an invite, <b>Shaquille Keith</b> (13.3 points 3.3 assists/Cape Breton Capers); 2013 Freshmen of the Year, <b>Deontay Smith</b> who averaged 17.7 rebounds, 7 rebounds and 4.4 assists for the UPEI Panthers. Regardless, if they we were both invited to training camp they wouldn’t have made the team. Specially when you have <b>Andrew Wiggins</b>opting not to play and the 2012-13 ACC Freshmen of the Year <b>Olivier Hanlan</b> also not in the mix as he decided to focus on school. Canada will need a top three finish in Group A in order to advance to quarter-finals. In order to accomplish this it will most likely need to beat Spain and/or Croatia. The game against Korea won’t be easy but should go Canada’s way. The keys for the Canadians will be how well they control the defensive boards and their limitation off turnovers. Outside shooting will definitely be a deciding factor as well.